Billy Joel's pop hit from 1983 is a perennial favorite and evokes an even earlier time in America's pop history. Now available for mixed and SSA voicings, your groups will love to perform these well-crafted arrangements. Duration: ca. 3:30. The iconic song "Seven Bridges Road" by the Eagles speaks directly to the heart with thrilling vocal harmonies that will showcase your ensemble at their best! "There are stars in the Southern sky/Southward as you go/There is moonlight and moss in the trees/Down the Seven Bridges Road." "We Will Rock You" - Your whole crowd will join in with the stomps and claps as you perform this rock and roll classic! 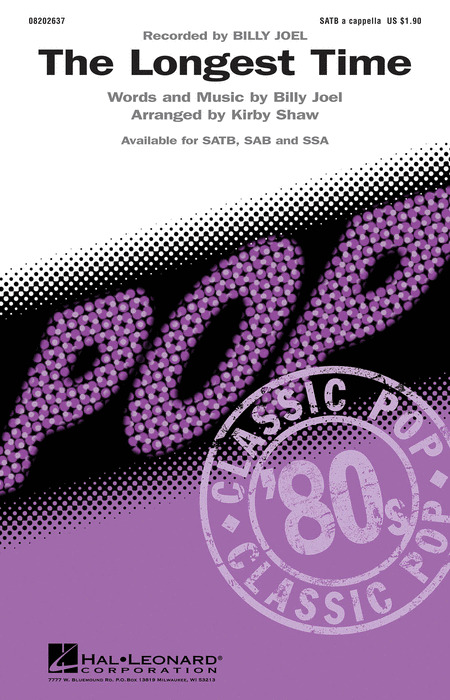 This classic pop hit by Queen will bring down the house. Billy Joel's pop hit "The Longest Time" is a perennial favorite and evokes an even earlier time in America's pop history. "Let It Be" is one of the landmark songs of the 20th century and certainly at the apex of the Beatles catalog, this #1 pop hit in this a cappella setting will be an inspirational choice for choral concerts of all types.